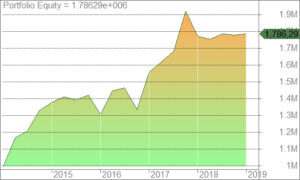 In honor of Mr John Bogle, on his demise, let me share a wonderful passive trading system. 01 decision per Quarter, a rotational system between Nifty, Nifty junior and Gold bees. 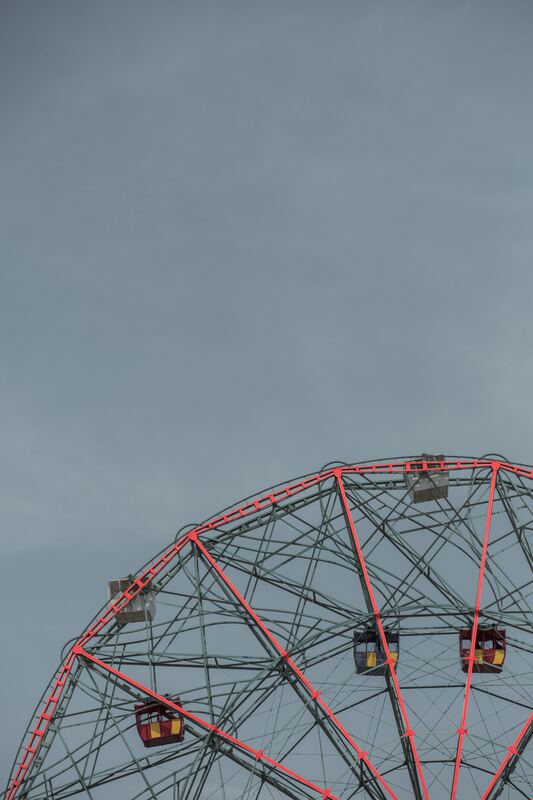 Rotation is done on the basis of Momentum score. It is different from MWM (MysticWealth Momentum) as unlike MWM, this is done on Index itself and has minimal churn. 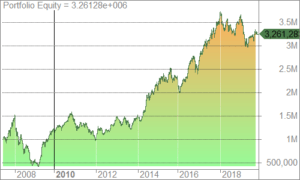 We buy Nifty bees on 29 June/2007 and hold it till 17/Jan/2019. In other words a Return of 105.20% which comes to 6.41% CAGR. Those of you who have been following our blog know that this standalone information does not tell us anything. Return is always calculated on Risk adjusted basis. Now I know value investors would make you believe that Volatility is NOT RISK and Permanent loss of capital is the only risk. 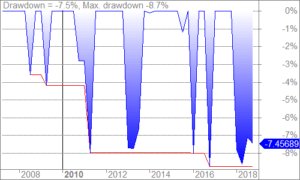 so to achieve this 6.41% return, you had to go through a 42% ditch and be stoic enough to NOT throw in the towel. To put things in perspective, current DD on Niftybees is not half as much . Now let us run the same game on our second constituent. Nifty Junior. 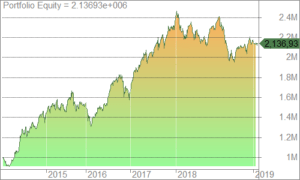 We buy Nifty Junior on 29.Jun/2007 and hold it till 17/Jan/2019. Our Starting 10,00,000 (Ten lakh) becomes 3261283 (Thirty two lakhs sixty one thousand two hundred eighty three. In other words a Return of 226.13% which comes to 10.78% CAGR. 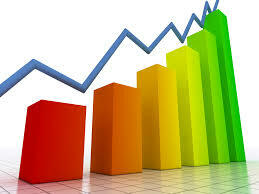 Of-course you can see the power of compounding at display, a couple of percentage points over a long period of time tantamount to a fortune, we can leave that to Morgan housel to explain, as he does that like nobody else. 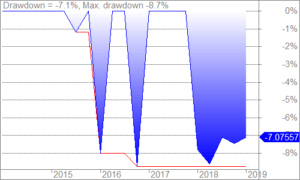 Now to achieve this return, lets look at the draw-down chart. Thats a crack of 72%. OUCH. What it basically does is calculate the momentum score of 03 constituents (Nifty, Niftyjunior and goldbees) and simply decides to put 100% of it in whoever has the highest RANK. 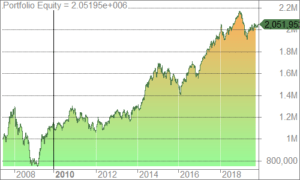 We Start on 26.Jun/2007 and end the backtest on 17/Jan/2019. In other words a Return of 542.95% which comes to 17.54% CAGR. To achieve this respectable return, we went through the following draw-down. That is very acceptable 10% crack. So a Total of 13 trades were taken in this period. Another important point raised with momentum on Index (or any historical study) is that the results change based on the start date. And you can sell your shoddy product by hand picking the dates that suit you. So let us run this on a genuine bull run without any 2008 kind of nightmare. Say a period of 2014-now. And Now let us look at Tortoise in the same period. 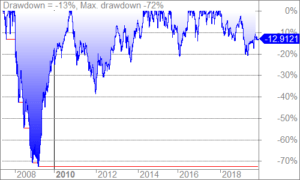 Remember we missed the first 03 months of 2014 in this backtest as quarterly system would not have data to take its call. 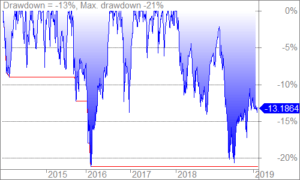 But No excuses, it is fair to say that this system will under-perform the indices in case of uni-directional bull run, however, the drawdowns would be within the human limit. I think leveraged ETFs are not yet available in India so may be pledging your holdings and running a covered call strategy on it can be nice icing on cake. So the jury is in. 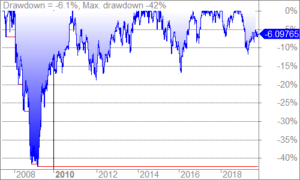 Momentum on index will under-perform index in case of a rip off rally, will out perform in case of a rip-off bear market but in any event will have manageable drawdowns. We would love to know how many of you would be interested in deploying capital in such a simple strategy. 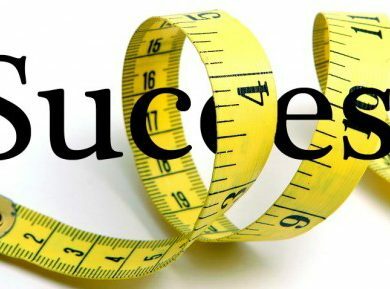 How do you measure success!!?? Nice Analysis. Glad if such system exists. I wish to understand the way to calculate the momentum score. (How to calculate the momentum score and rank them). Thanks. My system is proprietary however it is NO rocket science. Read Gary Antonacci’s dual momentum and Meb fabers timing model to move forward… Cheers!!! Simplicity is profoundness. Deserves a serious thought. Good work! Sir not enough volume is traded of Nifty bees and junior bees daily. is there a Smallcase for this just like “All weather Investing.” Can you make a Smallcase out of this and update it quarterly? I can make a small case but u wont have access to it. That would require a tie up between MysticWealth and smallcase. 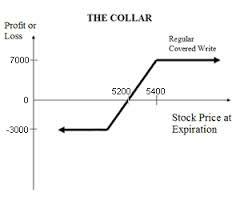 What is mean return and standard deviation of this equity curve. Will detail that in strategy brochure. 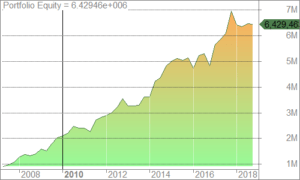 can u post monte carlo simulation page ( top part with percentile) snapshot from amibroker for your momentum strategy. Excellent article.Would like to know implementation procedure!